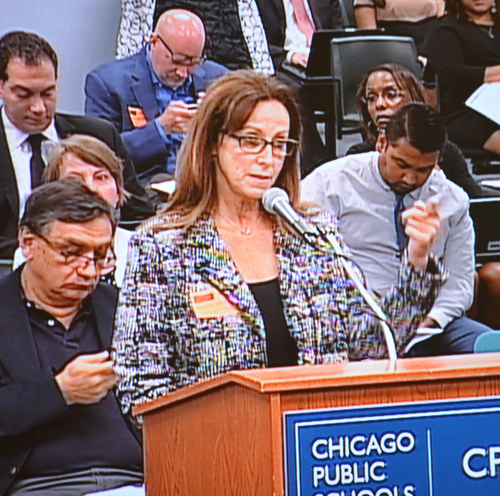 [The following is the statement read on July 23, 2013 by Diane Daleiden at the monthly meeting of the Chicago Board of Education. The statement provided to Substance by the Ms. Deleiden and is reprinted here with her permission. What was apparently not known to the Andersonville community is that the so-called "American Quality Schools" has been preying on the distant Austin community for as many years as Passages has plagued Andersonville. For the past eight years, Bakalisis' group has operated one of the failing small schools inside the huge Austin High School building in Chicago's Austin community. The Austin building was taken away from the community as a high school under false pretexts by Arne Duncan and Michael Scott, who claimed Austin had to be cleaned out of gang bangers, and then did a bait and switch, giving the school building to small charter schools instead of returning it, without gangs, as the community general high school the community needs. American Quality Schools has never been audited and investigated by Chicago Public Schools, and continues with its revenue streams thanks to the clout of its owners. George N. Schmidt, Editor]. �My name is Dianne Daleiden and I represent W.A.N.T, West Andersonville Neighbors Together where Passages, an elementary charter school, wants to expand. We are firmly opposed. Passages hasn�t been a good neighbor � continuous traffic problems, lying about holding community meetings never held -- and last year, when they tried to add a high school, they didn�t come to the community. They came to you. Our community banded together, pressured our elected officials and blocked that high school. Now they want to add 50 more students? American Quality Schools � a for-profit corporate management company � runs Passages. Its CEO, Michael Bakalis, claims they are losing money because they aren�t getting funding for 22 students. Why? Because Mr. Bakalis PURPOSEFULLY and KNOWINGLY exceeded their enrollment cap of 410 students by 22 students. That�s right � their MAXIMUM was 410 but they enrolled 432. And now they want 460 students which will cost us an additional $250,000? They broke their contract with you. You shouldn�t give them more money. You should slap them with a hefty fine for breaking their contract. But there�s a bigger question today � will this Board fund private charter schools at the expense of OUR NEIGHBORHOOD PUBLIC SCHOOLS again? Look what�s happening in my ward, the 40th � our neighborhood schools lost 2.5 million. Amundsen � 1.5. Chappell -- $94,000. Trumbull � closed, a school community ripped apart because of its real estate value. My neighbors and I truly care about our city, our schools, our ward but we are ignored. You�re not accountable to us and that has to change. We need an elected representative school board and, as a candidate for Alderman of the 40th Ward, that is one of my top priorities. Because like most Chicagoans, I still believe in democracy. Please, do NOT let Passages expand. Fine them instead.